Dates back to China’s Reform and openness. Since China’s “Reform and openness, capital and technology come in to Guangzhou all over the world.The Daily Chemical industry boosted quickly. Although 40 years past, Guangzhou’s strength of Daily Chemical in China is second to none.Unilever and Procter?&?Gamble Head Company of China were also set up in Guangzhou, the technology spillover effect by Brands in Guangzhou also has a profound impact. But in the period of time, the phenomenon of rampant fraud in? Guangzhou, also fake and shoddy, the prevalence of speculation, impetuosity. Many Manufacturer Guangzhou, relying workshop production, do the market penetration by low-cost. As a result, low cost manufacture of poor quality products, serious damage to the “made in Guangzhou,” reputation. After Guangzhou, Shanghai Daily chemical suddenly rise around 2005. Shanghai Jahwa Corporation is one of China’s oldest Daily Chemical companies. The China’s economic heart,as the window of China, a large number of internationally Daily chemical enterprise join into Shanghai,with cash, technology and ideas. What’s more, the dozens of prestigious univesity in Shanghai, a talents and technology guarantee for Shanghai Chemical daily development. Shanghai with so many advantages, but still can not over Guangzhou, the fundamental reason: Shanghai is the financial center of China, is a economy city.Guangzhou is a real manufacturing city. Shanghai manufacturing defects above. This time Zhejiang, Tianjin, Nanjing began to appear in people’s field of vision. The representative of city is Ningbo, Zhejiang, where i am, now. Shanghai hold the financial and technical strength, but the disadvange of policy and cost . Shanghai, as a “leader”, the surrounding cities such as Hangzhou, Ningbo, Kunshan, Wuxi, Suzhou, became a very close relationship,which including packaging materials, production and raw materials, product development, logistics distribution, etc, the entire Yangtze River Delta. The Yangtze River Delta supply the support in transportation, packaging, raw materials, human resources, culture and many other aspects. Anhui and others inland city. After the rising of Guangzhou, Shanghai and Zhejiang surrounding. 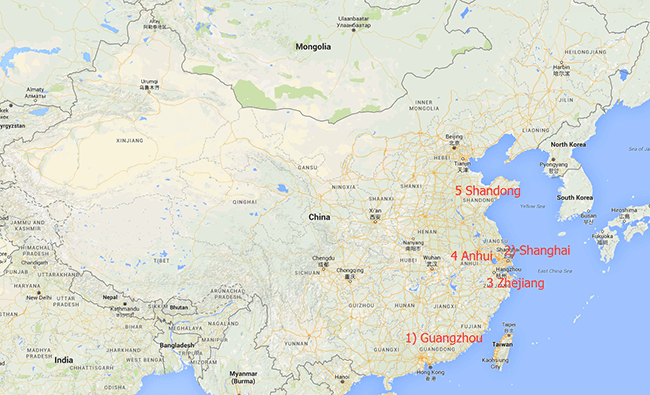 Anhui,Xi’an and other regions due to the advantage of the policy, cost, and others. Builting local daily chemical factory, but the manufacturing history of these areas is relatively short. Business owners are generally the core person from Guangzhou, Zhejiang and other long history Daily chemcial. Anhui and northwest area are low manufacturing costs. More and more goods are manufactuer by them now. However, the lack of technology and material result not good quanlity. We also worked with Daily chemical Factory in these area,sometimes. If you are not a price sensitive buyer, do not purchase goods in these areas. If you descide to purchase, please know the situation of enterprises in advance, visiting is also good.